The vacuum that truly cleans. And lasts. Since 1899, Miele has been dedicated to producing state-of-the-art home appliances, and we support your passion for a cleaner, healthier and more comfortable home with our innovative, award-winning collection of vacuum cleaners. Our canister and upright vacuum cleaners help you care for all aspects of your home. Miele's advanced, technologically-superior filtration systems also improve the quality of air in your home. 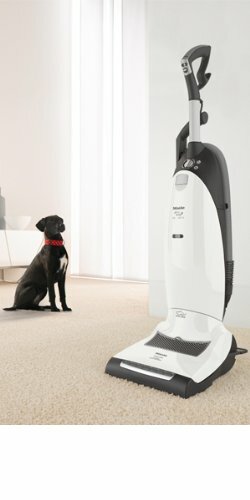 S7260 Cat & Dog Miele’s S7 Cat & Dog vacuum features a unique electrobrush that follows the contours of your floor, automatically adjusting for different carpet depths and surface coverings — providing even, consistent suction and gentle cleaning. The Cat & Dog features Miele’s AirClean Sealed System, comprised of an AirClean FilterBag and Active Air Clean Filter that captures and retains 99.9+% of dirt, dust and allergens. The Active Air Clean Filter has active charcoal layers to neutralize and absorb unwanted pet odors. The S7 Cat & Dog vacuum features a rotary dial control with four power settings that allows you to adjust the level of suction to the type of surface being cleaned. In addition to the standard included accessories — a dusting brush, upholstery tool and crevice nozzle — the Cat & Dog features a Mini Turbo Brush that easily removes pet hair from furnishings. Other conveniences include an LED headlight.